Map of Batangas c. 1918. 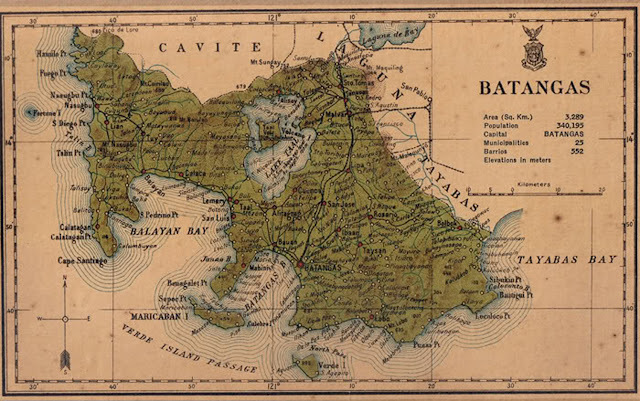 Above is a map of the Province of Batangas originally contained in the 1920 publication “Census of the Philippine Islands taken under the direction of the Philippine Legislature in the year 1918,” compiled by the Census Office of the Philippine Islands and published in 1920 by the Bureau of Printing in Manila. It has been downloaded from Wikimedia Commons where it is stated that the map is in the public domain, i.e. there are no known restrictions to its use or reproduction. For more information, please click here. The map has been enlarged from its original size.